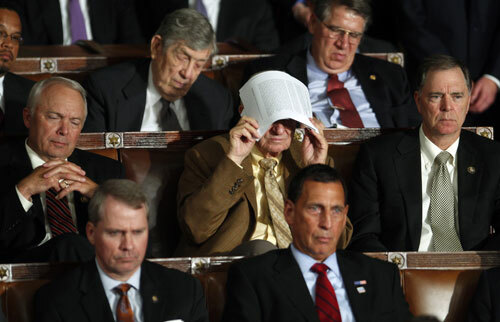 Images of those who seek to obstruct, undermine and smear progressives–while posing a threat to democracy. 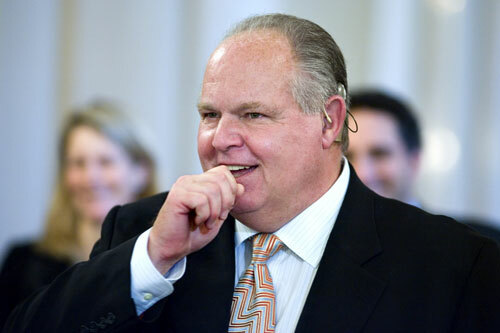 Just days before Barack Obama is sworn into office, right-wing radio titan Rush Limbaugh declares that he wants the new president to fail setting off a wave of criticism and re-establishing himself as the premiere vessel for reactionary rage. 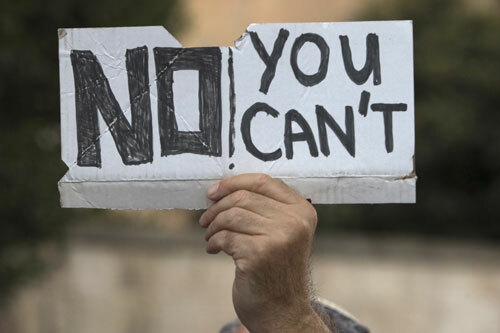 “The far right’s resentment is deepening: it angrily denounces Obama as a socialist, holds “tea parties” to protest taxation and has turned to Rush Limbaugh as a leader,” writes Kim Phillips-Fein. 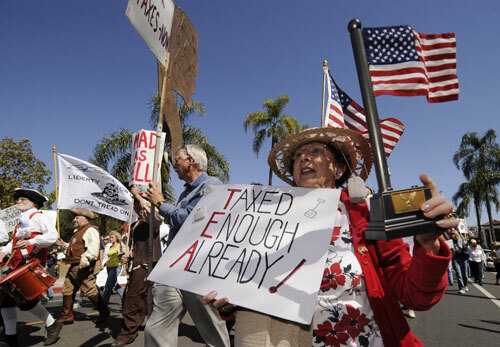 Shortly after President Obama succeeds in passing his stimulus legislation, conservatives begin to decry government spending and taxation in widely covered and somewhat unfocused so-called “Tea Party” protests. While the right insists these demonstrations are part of a grassroots movement, the evidence suggests they’re part of a well-funded ideological crusade. 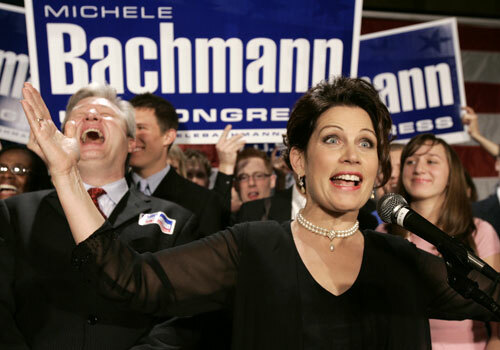 One of the most vocal and eccentric of Washington’s wingnuts has consistently been Minnesota Rep. Michele Bachmann. Prior to Obama’s election, Bachmann, in a throwback to McCarthyism, calls for an investigation into what she calls “anti-Americanism” in Congress. 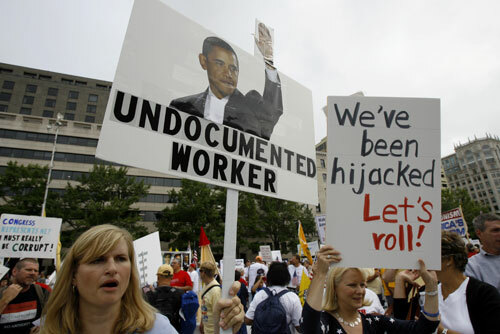 Once Obama is in office, Bachmann manages to fearmonger on the census, ACORN, AmeriCorps, healthcare and more. 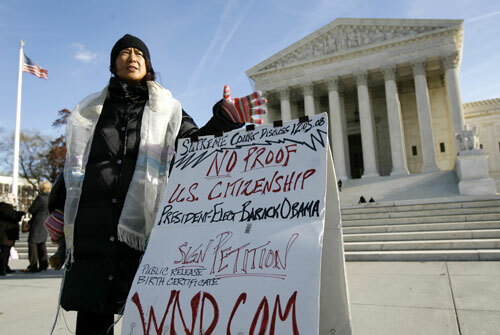 For some on the right accepting Obama’s legitimacy as president is a bridge too far. A small but relentless group dubbed “birthers” by the media insist that the president is not born in the United States and rather a native of Kenya. Their conspiracy theories are largely laughed off and rebuked, yet their cause finds a sympathetic audience within some Republican circles. 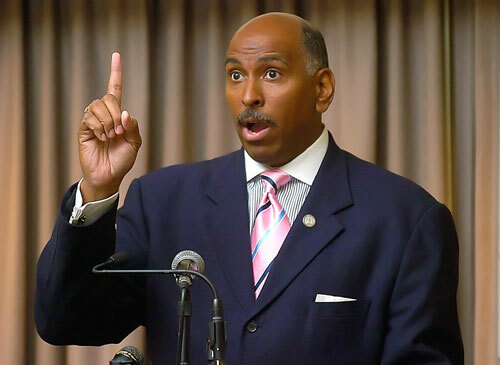 Michael Steele’s election as chairman of the RNC is supposed to herald a new era of conservative open-mindedness and outreach. 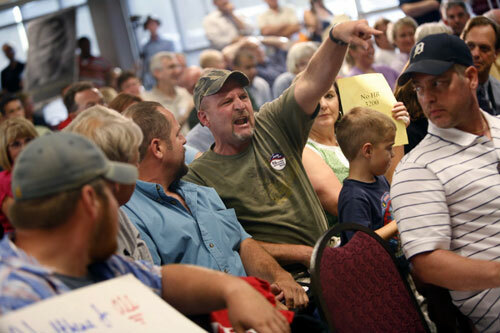 As the healthcare debate heats up over the summer, right-wingers bring their anti-government, anti-Obama aggression out in full force at town halls all around the country. Shouting at members of Congress and hurling abuse at pro-reform advocates, their often illogical rants and hate speech dominates the national discussion for weeks. One of the most disturbing trends to emerge during the town hall debacles is the appearance of gun-toting protesters even at events where the president himself is scheduled to appear. 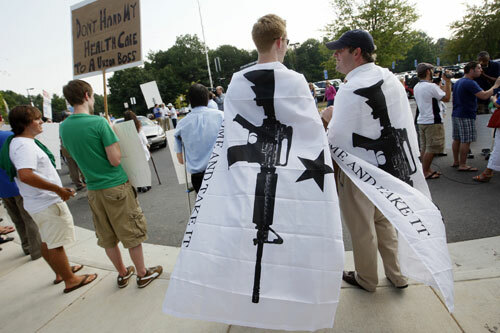 These zealots use the tepid excuse of celebrating the Second Amendment to justify their incendiary behavior; nevertheless, citizens across the nation are deeply disturbed by their audacity of hate. 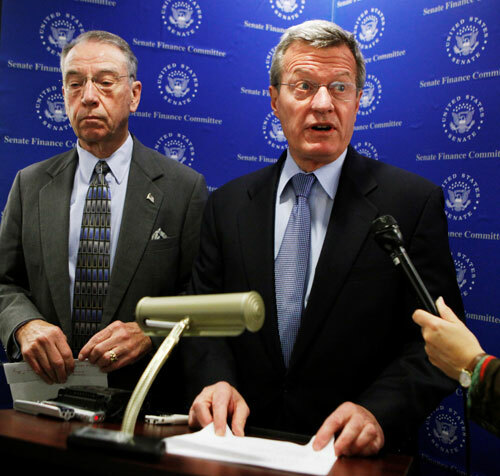 Meanwhile in the Senate, the Finance Committee, led by Republican Chuck Grassley and conservative Democrat Max Baucus seems to go out of its way to neuter and delay healthcare reform. Besides refusing to back real reform, Grassley insists the legislation authorizes “death panels,” a scurrilous claim that is easily debunked yet somehow gains traction. “It takes considerable skill to convince people that something that is clearly good for them–like universal healthcare–is not. If the right is crazy, they’re crazy like a Fox News presenter,” writes Gary Younge. While offering no real alternative to the status quo, conservative legislators still manage to shape the healthcare debate. 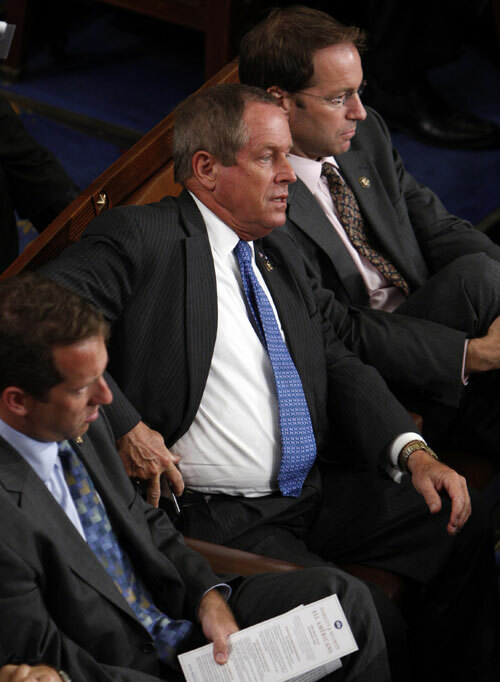 During President Obama’s long overdue and well-received address to Congress outlining his principles on healthcare, a little-known congressman from South Carolina, Joe Wilson, becomes infamous overnight by screaming “You lie!” at the president when Obama asserts that undocumented immigrants will not receive health benefits under his plan. Immediately after the speech, Wilson becomes a right-wing folk hero, is admonished by the House and his opponent raises thousands. Arguably the most ubiquitous and influential right-wing voice on television right now is Fox News’ Glenn Beck. Not only did he call President Obama a racist, he strategically targets White House officials (such as ex-green jobs czar Van Jones) with self-indulgent smear campaigns. The Nation‘s editors believe the tragedy is that a “vile, clownish demagogue” like Beck has such a rabid following intimidates the Obama administration and shapes public opinion. 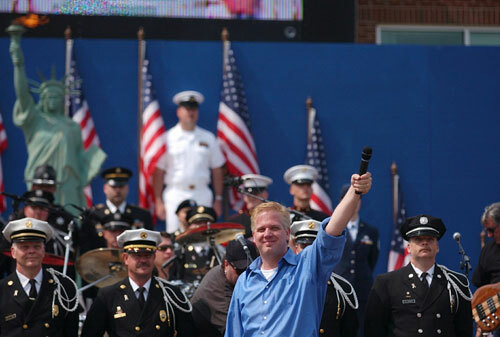 Beck’s rhetoric leads to the “9/12” protests whose alleged goal is to inspire Americans to return to the state of mind they were in the day after the September 11, 2001. The reality on the ground is that the attendees are “almost exclusively white–and its members had come to get their country back…their republic restored. A country, one could only assume, that resembled the crowd,” writes Sebastian Jones. Their racist invective harbors a violent undercurrent which doesn’t bode well for the future of not just the Republican party but the American republic itself.